Carnival Corporation has celebrated a new shore excursion which it helped to fund in the popular Caribbean cruise destination of St. Maarten. The new Rockland Estate eco-park attraction features the world’s steepest zip line along with additional tours. Before we get into the details we’re so happy that a new island attraction in St. Maarten has opened up especially since the devastation caused by Hurricanes in September 2017. 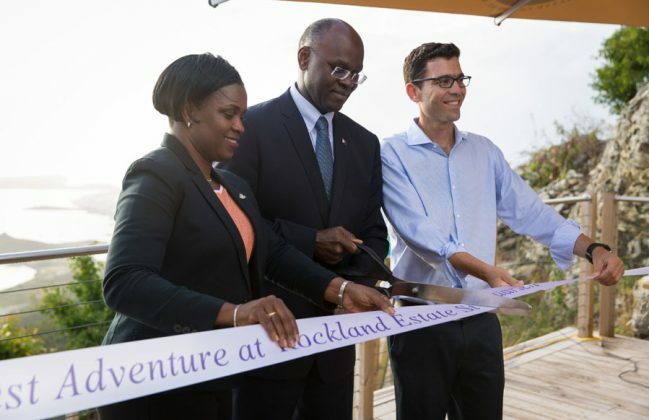 Cruise guests not just from Carnival Cruise Line but all Carnival-owned brands can enjoy the new Rockland Estate eco-park attraction. 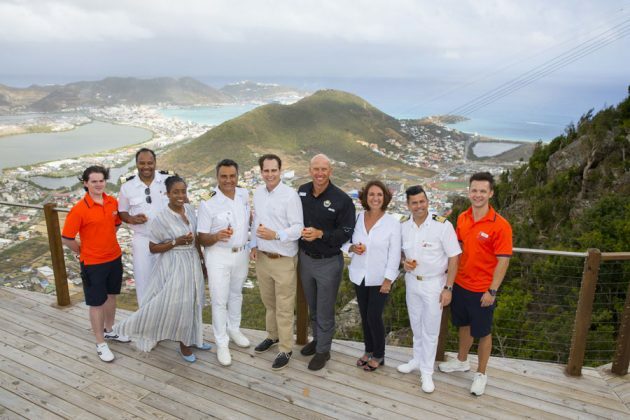 A Ceremony was held on April 11 at St. Maarten in the Eastern Caribbean to mark the opening of the new island adventures. The new offerings include a mountain chair lift with breathtaking views and a heart-racing tube ride, as well as a museum that showcases the rich history and culture of St. Maarten and its people. The Rockland Estate park is committed is preserving native eco-systems and bringing the island’s culture to the visitors. The next time your cruise ship itinerary features St. Maarten this attraction will be worth looking into as there are many things to do no matter if you’re looking for a thrill, want to relax or learn more about the island. Soualiga Sky Explorer encompasses 68 four-passenger chairs that take guests to a transfer station for zip line and tubing rides, and then on to the top of one of St. Maarten’s highest points at 1,125 feet where they can take in spectacular panoramic views. From the transfer station at the midpoint of the Soualiga Sky Explorer, guests can experience the exciting Sentry Hill Zip Line, where riders traverse a 1,600-foot, four-span line that provides unforgettable vistas of the mountain ridge. The Schooner Ride at the midway point of the Soualiga Sky Explorer gives guests the chance to surf down the mountain in large 40-inch inner tubes across a specially designed 657-foot track of heart-pounding curves mixed with fast straightaways. One of St. Maarten’s highest elevations, Sentry Hill, offers walkways and platforms that encircle the mountaintop, showcasing 360-degree vistas of the island with views of neighboring Saba, St. Barts, St. Eustatius and Anguilla. 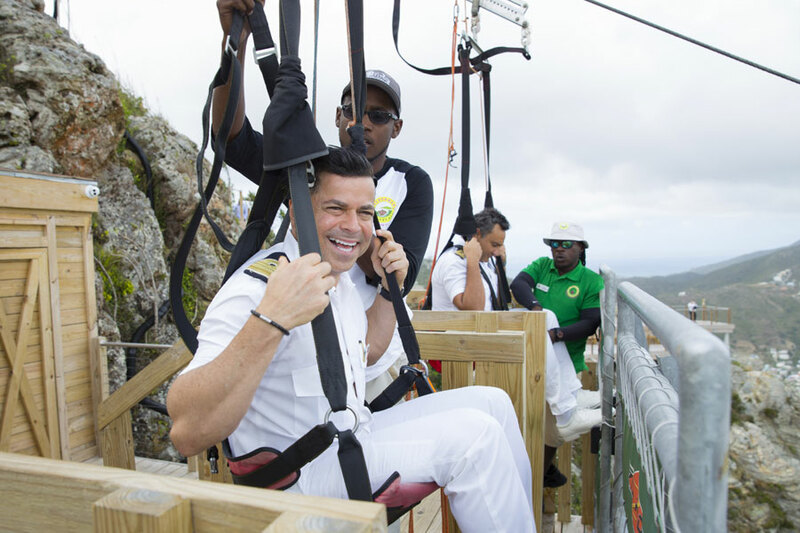 The Flying Dutchman is Rockland Estate’s main attraction and the world’s steepest zip line. It guarantees thrill-seekers the ride of a lifetime while securely harnessed in a chair, dropping them 1,050 feet in elevation from the top of Sentry Hill down the mountain over a 2,800-foot span. St. Maarten is among the most popular cruise ship destinations in the Caribbean with 1.66 million guests visiting in 2016. The island has plenty to offer including stunning beaches, shopping, adventures and a lot more.